I can’t believe it! 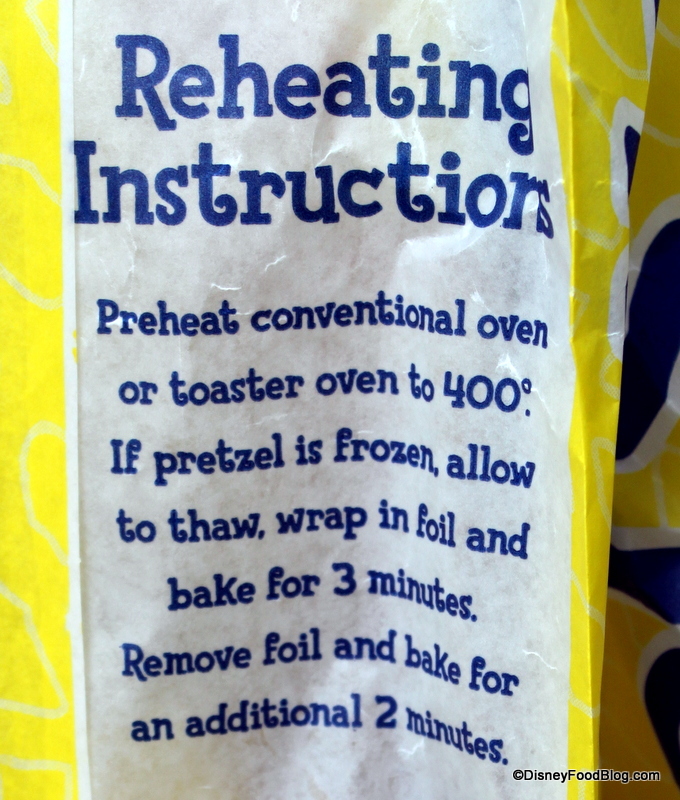 I have never done a review of Wetzel’s Pretzels! How is that even possible?? Actually, we all know the answer to that. I mean, there’s just so much good food to be enjoyed that it’s hard to fit it all in. 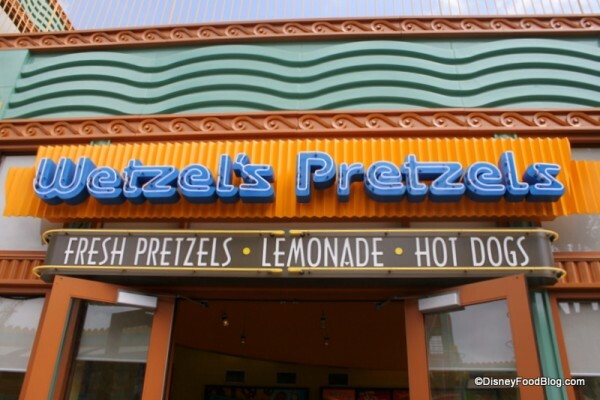 Still, Wetzel’s Pretzels deserves its due. 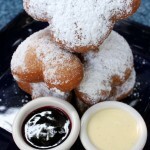 And so today, we’re visiting their location in Disneyland’s Downtown Disney District to take a closer look at some of their irresistible specialties. Their sign out front pretty much says it all. 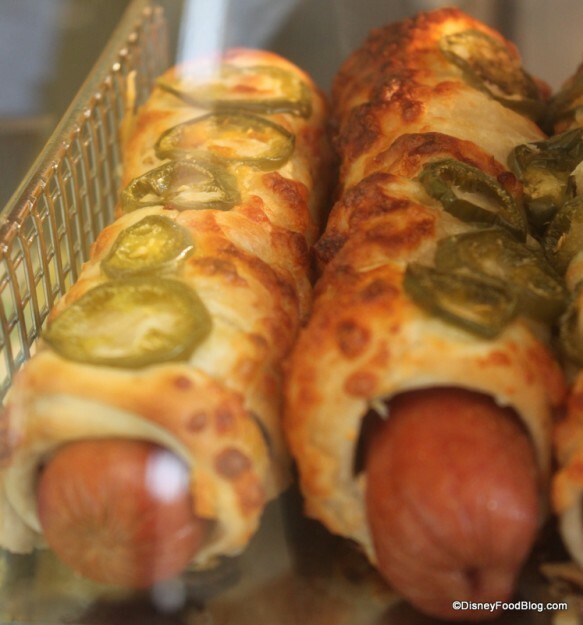 It’s the trifecta of snack foods — fresh pretzels, lemonade, and hot dogs — emphasis on fresh. 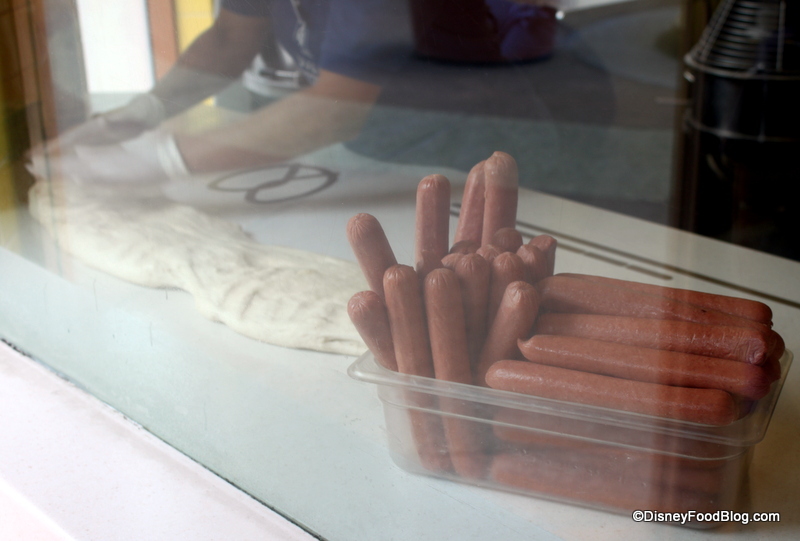 We were even treated to a front row show of employees putting together those famous Wetzel Dogs! It’s really cool to witness firsthand that the items you enjoy here are prepared right on the premises. Signs around the store gave us ample suggestions about what we should enjoy during our visit. I love their generous use of jalapenos here! 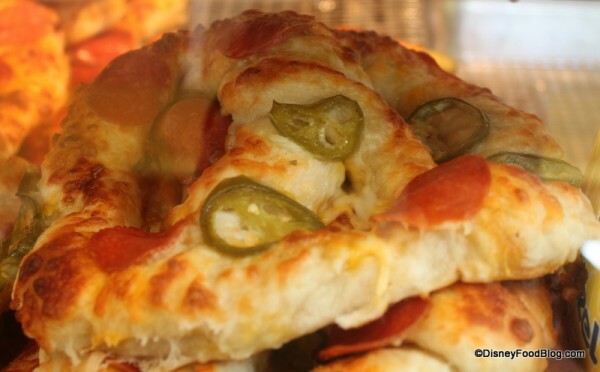 Reminds me of one of my favorite Disney pretzel treats, the Jalapeno Cheese Pretzel. Check out the menu for details on what they offer. If you aren’t familiar with Wetzel’s Pretzels, you may think it’s just a snack stop. 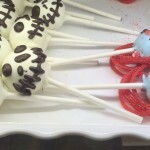 But while selections definitely fill the snack genre, you can make a meal out of them as well. 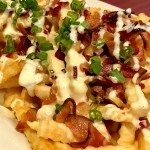 Pictures of some of the menu items might help you make just the right decision! Because if you come in hungry with no game plan you’re probably going to leave with one of everything. Trust us on this. In addition to snacks, there are also lots of drink choices. You can stick with the normal fountain drink options, of course. 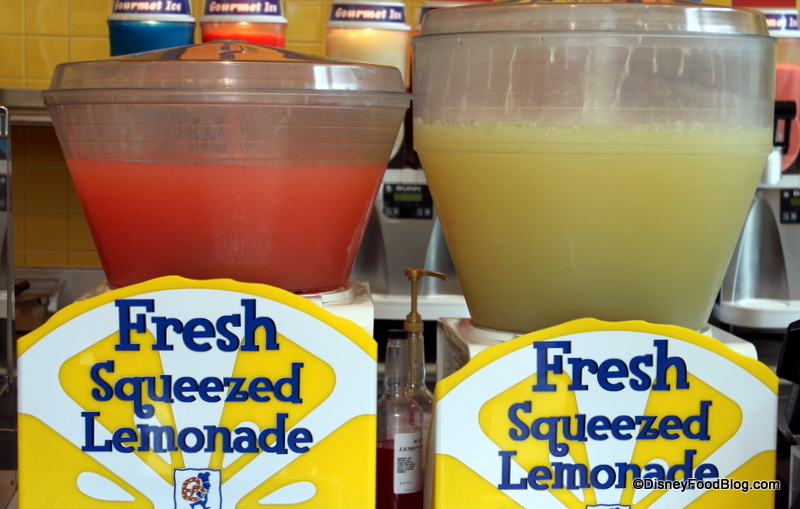 But you can also choose from Fresh Lemonade in Original or Strawberry. You can also score your lemonade in a frozen version, with Original and Strawberry varieties here as well. You can also choose from Granitas. Basically, these are just more frozen drink options. On the day we visited, they were offering Kiwi Strawberry and Blue Raspberry. 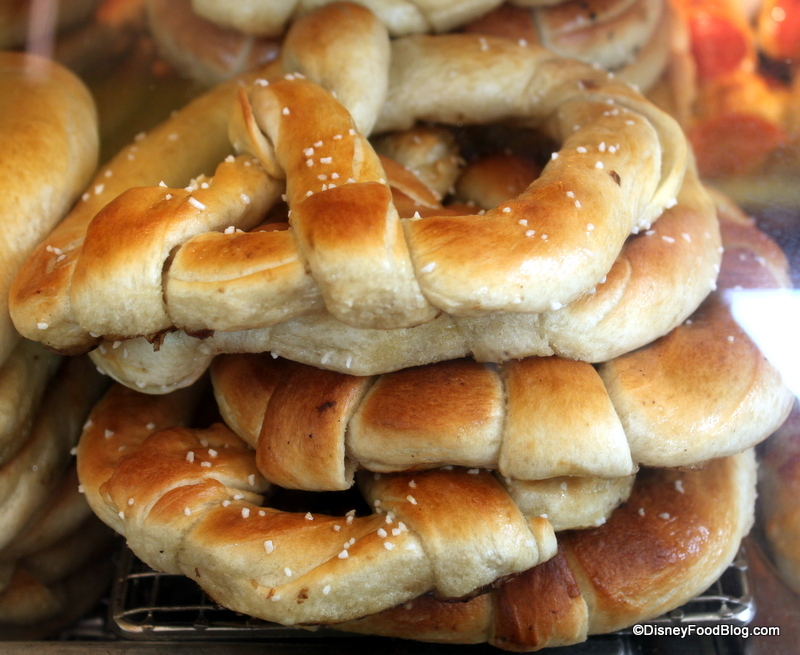 Preview your pretzels with a glance at the options available in the cases. 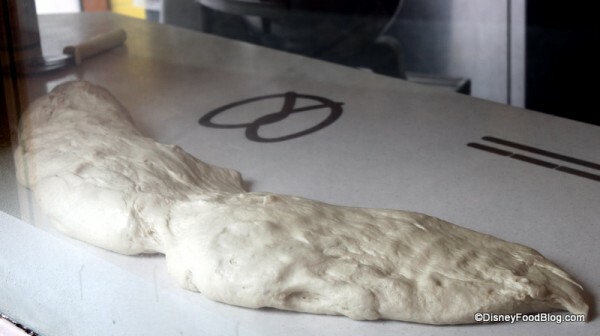 Here’s a shot of the classic Original Pretzel. 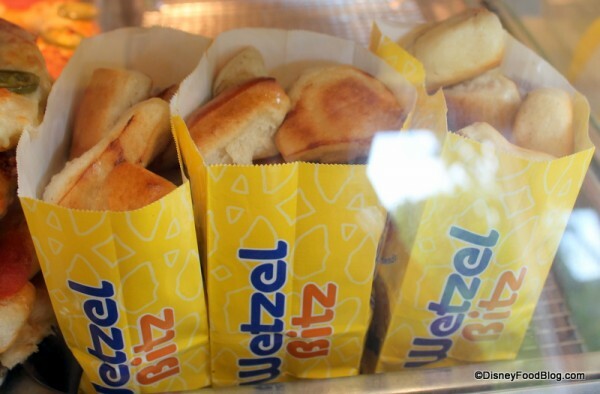 Wetzel Bitz, bite-sized pretzel pieces in a convenient bag, are perfect for sharing. These are the plain version, but there are also Gourmet Bitz in a variety of flavors — Sinful Cinnamon, Almond Crunch, and Sour Cream and Onion. If you’re looking for something a little more satisfying (read: you’re starving and a snack isn’t gonna cut it), Wetzel Dogs pack a protein punch. They also come in different varieties. Here’s an up close shot of the plain version. And did someone say dipping sauces? Ah — you know it! 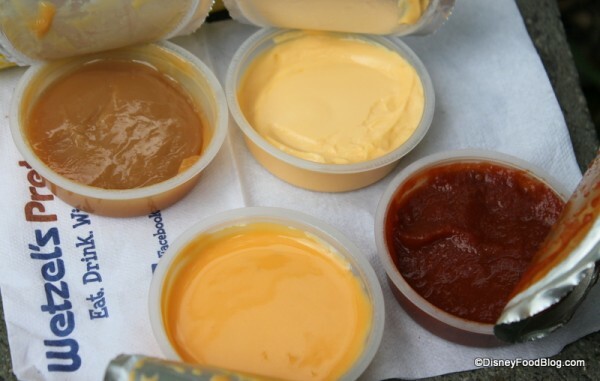 You have four to choose from: Cheddar Cheese, Pizza Sauce, Jalapeno Cheddar Sauce (they really love jalapenos at this place), and Caramel Sauce. 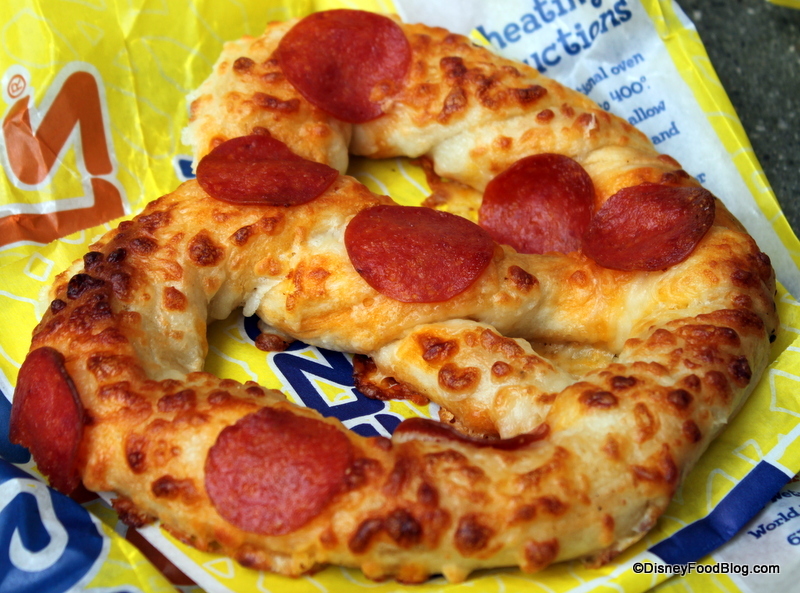 I love their Baked Cheese Pretzels, so I began with the Pepperoni Twist. Topped with Cheese and Pepperoni, it’s all the flavor of pepperoni pizza in a snack size portion. I loved the flavor and texture of the pretzels!! And dipping it into pizza sauce makes it even better. I also decided to sample a Cheese Dog — because how could I not? 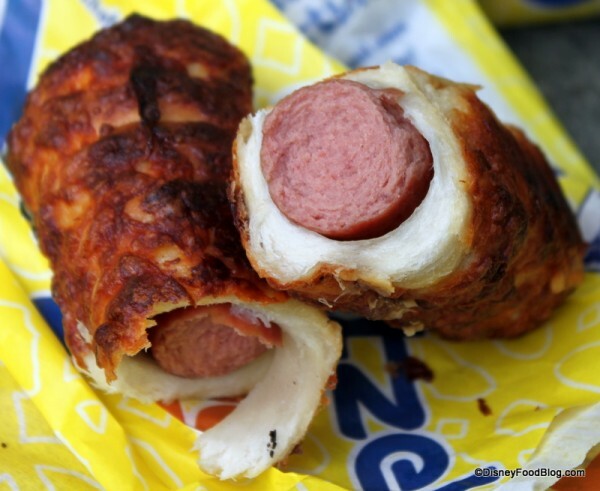 You know I love hot dogs, and I have a special place in my heart for varieties wrapped in bread of some sort. 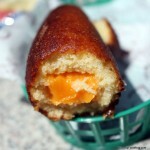 (Witness our not-so-secret obsession with Disney’s hand-dipped corn dogs in Disney World and Disneyland.) So this is a no-brainer. 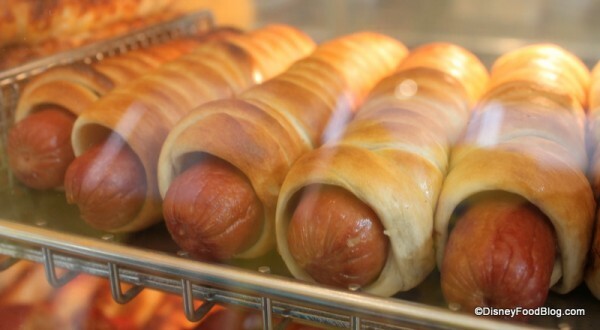 Wrapped in strips of fresh pretzel dough and baked, this reminds me of the saucisse we used to get when I lived in Switzerland. 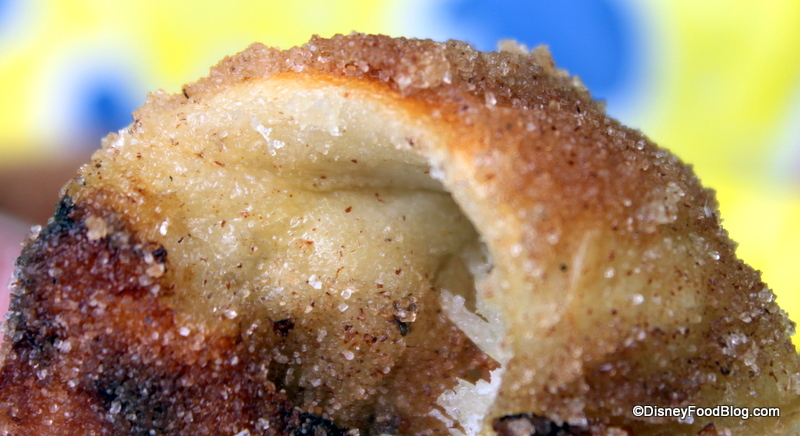 And you can see how tender the pretzel dough is from this shot. It’s not chewy like traditional soft pretzels. 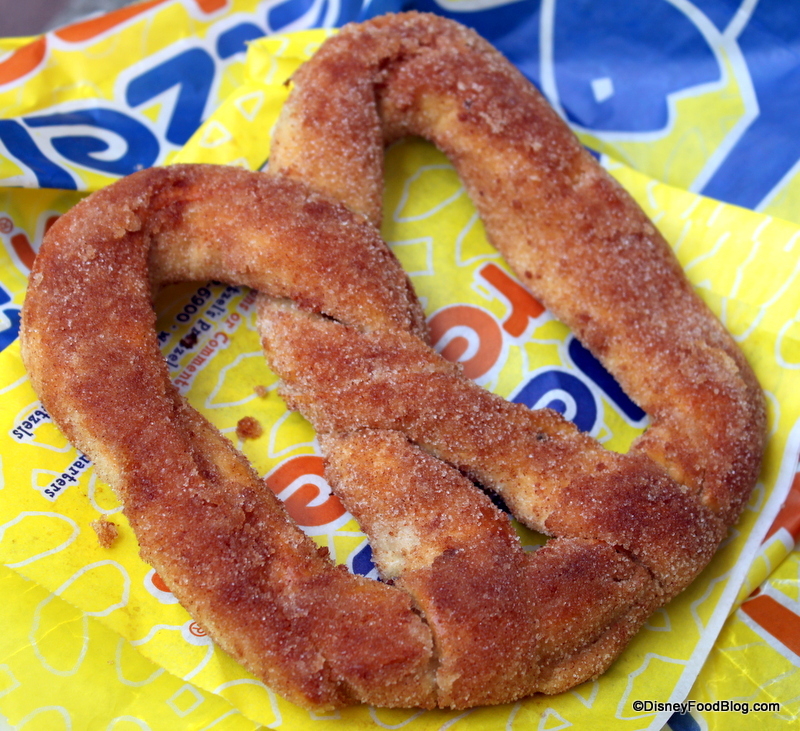 Finally, I made my way to dessert, and chose the Sinful Cinnamon Pretzel for my sweet ending. This was OUT OF THIS WORLD. I love indulging in cinnamon-sugar toast at home, and I always douse the bread with a bunch of butter before I sprinkle the cinnamon-sugar on top. It sticks to the melty butter in the most fabulous way! And this is what the Sinful Cinnamon pretzel reminded me of! And as you can see, that soft dough lends itself perfectly to sweet toppings as well as savory. If I had one teensy tiny complaint here, it would be dip-related. Sure, caramel is terrific. 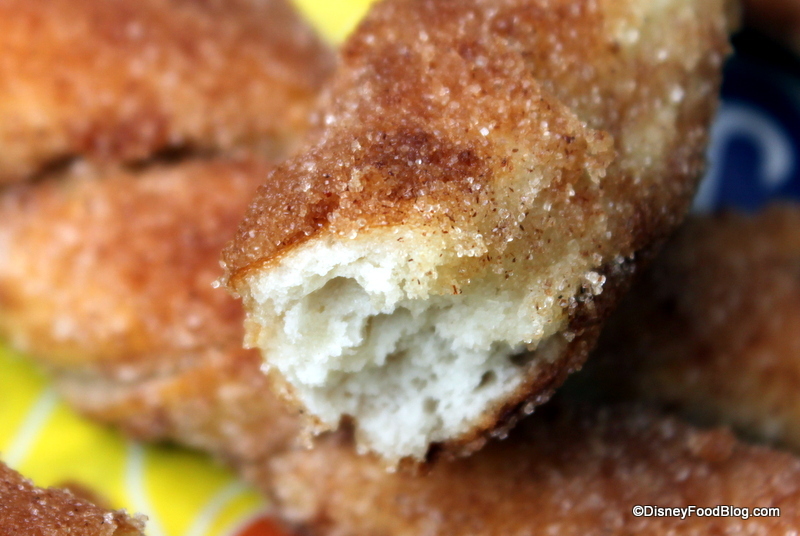 But just think of the perfection of dunking this cinnamony goodness into sweet cream cheese dip! Wetzel’s — are you listening? Will you get right on that, please? 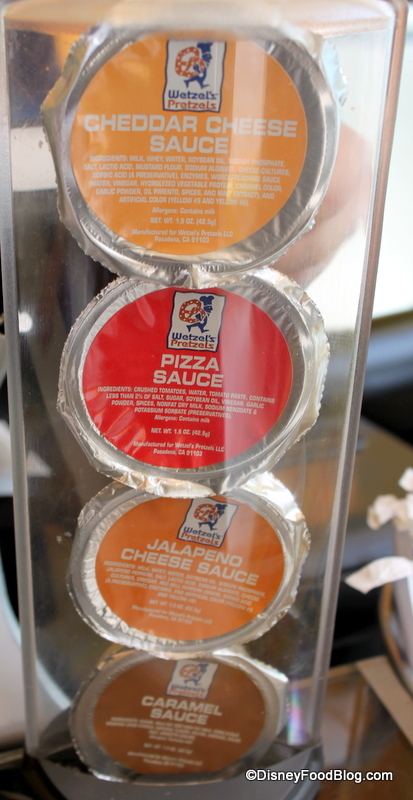 Speaking of, I couldn’t resist showing you all four dipping sauces — and trying them, too! You know. For research. The cheddar cheese is thick dip, featuring that not-quite-realistic-but-still-delicious processed cheese flavor. The jalapeno cheese was much thinner and, of course, spicier. Very good. 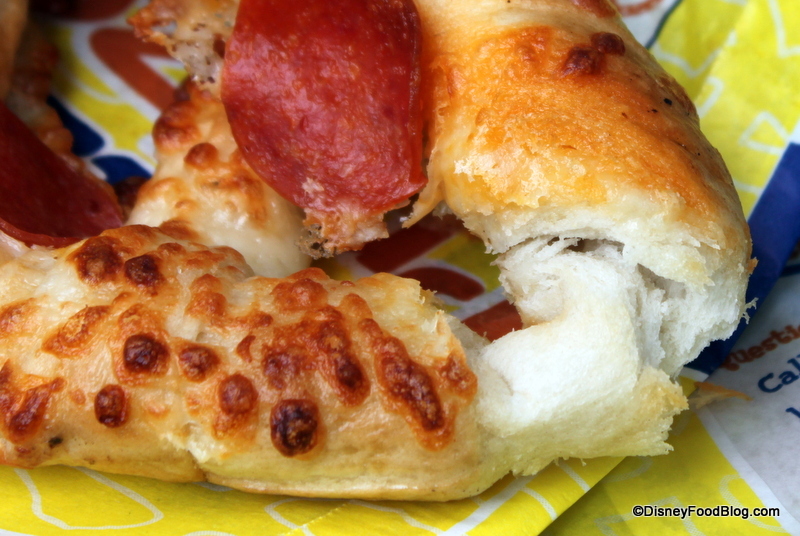 The pizza sauce didn’t wow, but it’s a good way to add a little something to those pizza pretzels. And the caramel sauce had actual flavor — not just a thick, sweet paste. Full to the top with carb-loading goodness, we headed back back out into the California sunshine for more Disney fun. Oh, and never fear if you’re getting your pretzel goodies to go — handy reheating instructions printed right on the bag make the process a snap. Wetzel’s Pretzels is just so worth it. I wasn’t sure at first, but…really…they’re awesome. With flavors and textures that are unique and delicious, the pretzels here have a permanent spot on my Disney food list — and that’s saying a lot for non-Disney food! Is Wetzel’s Pretzels one of your favorite snack stops at Disney World or Disneyland? Leave a comment and tell us about your favorite menu item! 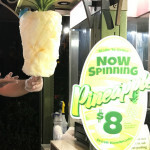 You’ve Gotta See This Pineapple Cotton Candy in Disneyland! Eight years ago my wife and I were on our honeymoon out in California and we spent three days of it in Disneyland. I had been out of work for a good number of months before we got married and money was very tight. Luckily most things were paid for before I was laid off, but we had very little spending money. We decided that since Downtown was so close we would walk over there for our meals and save some money. 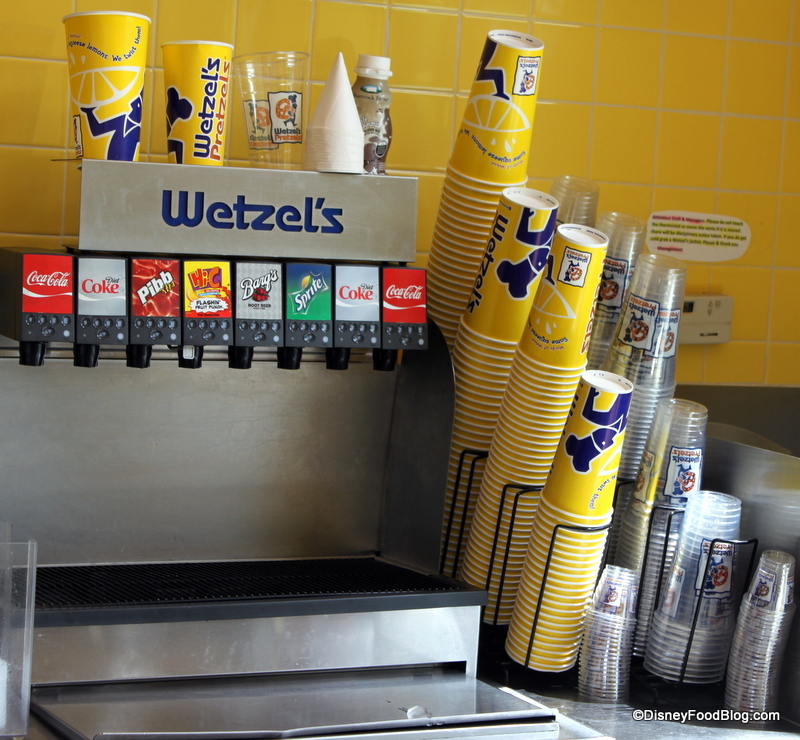 We ended up at Wetzel’s every day for lunch. 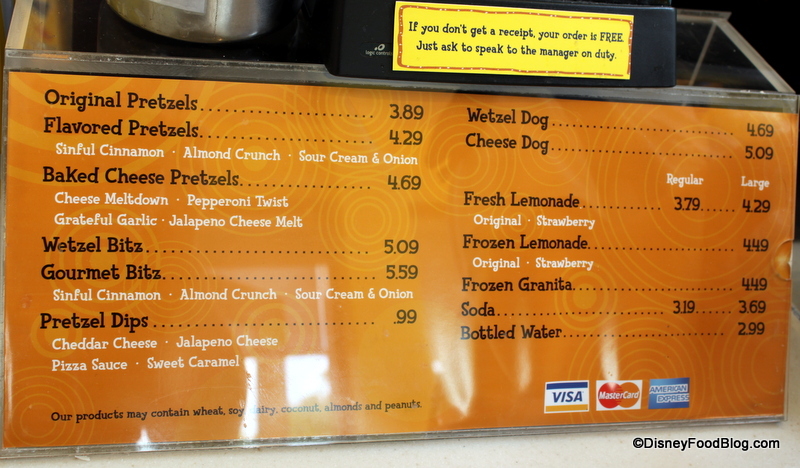 I got a pretzel dog every day we were in the parks, so Wetzel’s is kind of a special place for us because of these memories. Several Wetzel’s have opened up near us since then so I of course need to get a pretzel dog (with cheese) every now and then. I swear I remember the Wetzel’s kiosk in Downtown Disney Orlando having cream cheese dip as an option. Did I dream this? Bill — What a great memory! Thanks for sharing with us! Susan G. — Hmm.. we’ll have to check that out! 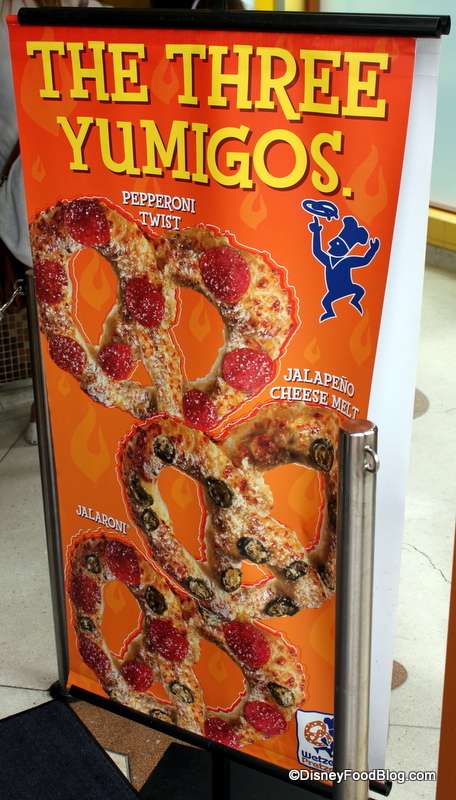 Erin — Believe it or not, I’d probably prefer the sinful cinnamon pretzel!! That review makes me want to try the place even though time in Parks is going to be like Water in July during ABD Backstage Magic. I wonder if they’re Microwavable for those who don’t have ovens in their rooms. Thanks, AJ! Love your reviews!